So how did this happen, and why is this discovery so huge? Previously humans have used light of varying wavelengths to describe our universe. Visible light first revealed the starry nether space, infrared allowed us to peer further back in time and see older, more distant stars. Radio waves revealed the afterglow of the universe’s violent birth, and X-rays showcased the supernova deaths of massive stars. But now, scientists will be able to sense the universe in a whole new way: through sound. That is because you don’t visualize gravity waves, you hear them. Gravity waves are the ballads of the universe, and for the first time in human history we are able to hear that song. Gravitational waves, which Einstein predicted as part of his general theory of relativity, occur as objects accelerate/decelerate through space, analogous to a boat moving through the water and the resulting ripples it produces across the water’s surface. Every object produces a gravitational wave, but they are so tiny that until now it has been nearly impossible to detect them. 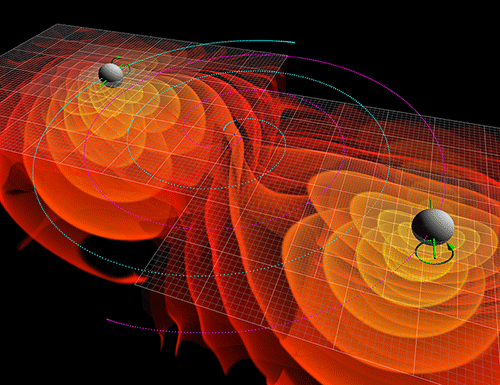 The current discovery was the result of the collision of two black holes (a rare but powerful event in space). As the two black holes collided with each other, they distorted spacetime, generating a cycle of waves, strong enough for the Laser Interferometer Gravitational-Wave Observatory (LIGO) to detect 1.3 billion light-years away. And to answer your question, yes, we detected the sound of something that occurred over a billion years ago. So what does the universe sound like you ask, oddly enough, like a bird chirping. Go figure. To learn more about gravity waves and why they are important, check out LIGO’s informative website. Also The Atlantic has an awesome in-depth piece about what this discovery means, and with this recent discovery people are already theorizing about what we should listen to next! You can read the original article about this amazing discovery in the journal of Physical Review Letters where they go into detail about how they were able to make their detection. Science, why you so cool?! Happy FSF all!! !